• View topic - Can we build off it? Can we build off it? Very interested to see how we come back from playing probably our 2 best games of the season, even though we came up short against Wofford. With this 2 game homestand we really have a chance to get back in the hunt for a .500 league mark. Re: Can we build off it? The Furman game could prove to be more than just a single win against a good team. Maybe it is the game that ratchets up our moxie another level or two going forward. I thought we showed a lot of guts against Furman. I'd like to see us build on that gutsy performance to start eeking out wins in close games. It’s really neat how you guys still think a win can result in consistent improvement and could be a sign of things to come. We are Samford. We can beat anyone and lose to anyone on any given night. The one thing that is certain is that anything to build upon will not be built upon. Just when we look like we have no hope, we’ll beat a front runner and then turn around and lose to a bad team the next game. Its what we do. We are consistently inconsistent in pretty much basketball and football. Cujo wrote: It’s really neat how you guys still think a win can result in consistent improvement and could be a sign of things to come. 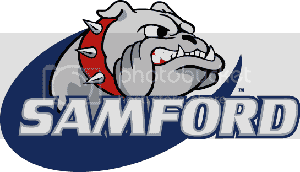 We are Samford. We can beat anyone and lose to anyone on any given night. The one thing that is certain is that anything to build upon will not be built upon. Just when we look like we have no hope, we’ll beat a front runner and then turn around and lose to a bad team the next game. Its what we do. We are consistently inconsistent in pretty much basketball and football. Insanity is watching/doing the same thing over and over and expecting a different result. An honest look in the mirror can sometimes be sobering, but the first step to recovery . . . .
And we win! What are we now, 4-7 in conference?